Windows Mail and Windows Live Mail are replacements for Outlook Express. Since the programs are similar, the instructions for creating an email signature with an image are similar. However, there are differences. One example is Live Mail may display the image border with a red X and not the contents.To make the instructions a bit easier, I broke them into sections. The first section deals with creating the elements you want in your signature. I refer to this as the “Signature source file”. This HTML includes your graphics such as a logo and accompanying text. The second part details how to link that file to your email signature. The last section should be used if your email signature only shows a border. From the File menu, click New and then Mail Message. The New Message window opens. Navigate to the image file you wish to insert. Click the Open button. Your image should show in the New Message window. Optionally, you may add text. Type your File name and select HTML as the file type. Now that the file with your image and text is saved, you need to point your email program to it. In the Signatures section, click the New button. 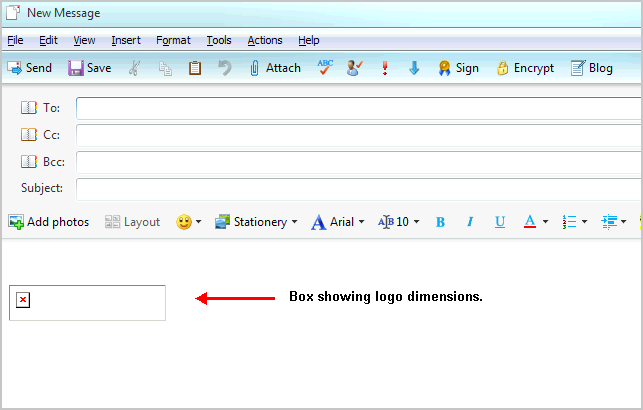 In the Edit Signature section, select the radio button for File. Navigate to the HTML file you just created. You may need to change the file types list to HTML Files. Check your desired Signature settings. If you’re a Windows Mail user, you’re done. When you create an email you should see your image signature appear based on your settings. You’re not as lucky if you’re a Windows Live Mail user. Rather than seeing your image, you may see a box representing your image or logo dimensions. The reason this problem happens is the way Live Mail references the image in your HTML file. To fix the problem, you need to replace the cid: location with the file’s path for your image. The thumbnail below shows an example of this cid: reference. Navigate to your image file with Windows Explorer. Right-click the image name and select Properties. On the General tab, click to the right of the Location: line. Press Ctrl+C to copy the file path to your clipboard. Using Notepad or a HTML editor, open your HTML signature file. Remove the contents between the quotes. Press Ctrl+V to paste in your file path. Although you do have to do extra work to add an image to your email signature, it can be worth the effort. The good news is you only have to do this process once per signature. And for those people that haven’t tried Windows Live Mail, you should consider it as it offers more features and security. If you still don’t see your image, you may need to go to Tools > Safety Options… > Security Tab > Download Images section and uncheck Block Images.